In a year when winter seemed to last forever, spring break program planning proved to be quite a gamble. We committed to a nature-themed program in the autumn of 2017, not knowing whether the weather would cooperate. 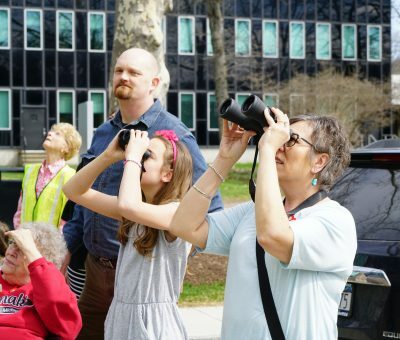 This year was much different than anything we’ve done before: citizen science, community partners, and nature walks, oh my! We decided to focus on nature for several reasons. 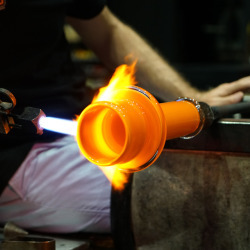 First, nature has been a source of inspiration for glassmakers for thousands of years. 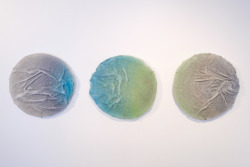 Second, there are naturally occurring glasses – such as obsidian – on view in the galleries. And finally, glass instruments can be used to observe nature up close. 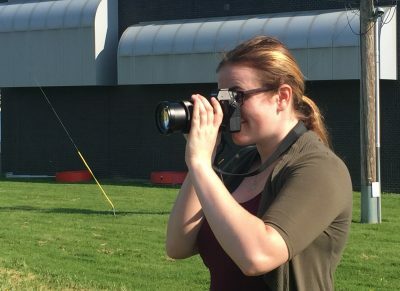 Here are some of the ways we used glass to explore the natural world around our campus. 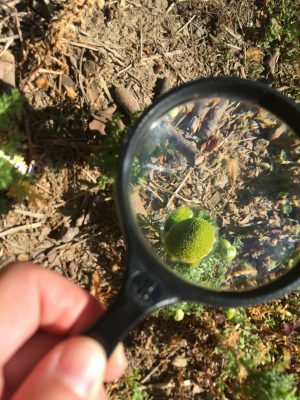 We used magnifying lenses to get a closer look at small specimens. 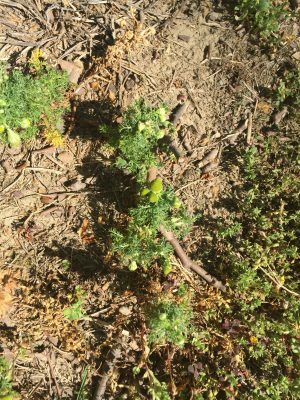 This is a wildflower called pineapple weed. When the flowers are crushed, they give off a pineapple scent! We examined samples of Chemung River water as well as samples of lichen growing on the trees around the Museum. 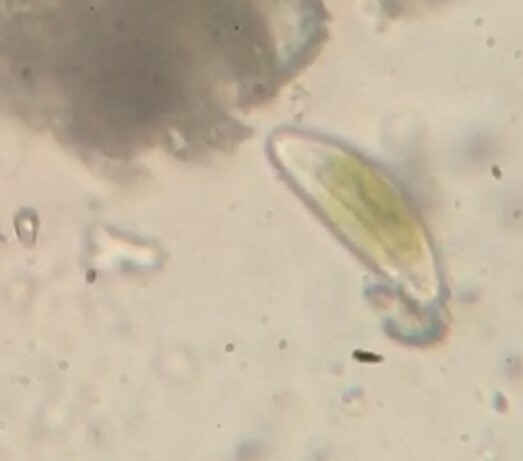 The thin, green D shape you see is a diatom. 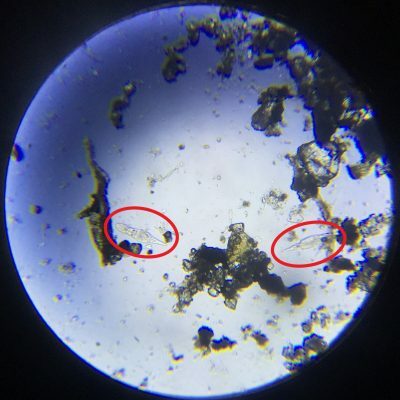 The transparent critters circled in red are called rotifers. The dark blobs are pieces of the lichen in which they were found. We found diatoms (microscopic organisms with siliceous – glassy – skeletons) in a sample of Chemung River water, and rotifers (check out this video of them moving around) or “wheel bearers” living in lichen. We never would have seen these without the microscope. It just goes to show that much of the natural world is too small to see with the naked eye. Used the traditional way, binoculars are like telescopes which make distant objects, such as birds, appear larger. 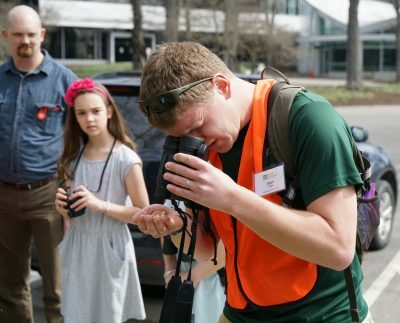 One of our community partners, Elijah from Letchworth State Park, showed our visitors that by flipping the binoculars (looking through them the “wrong way”) and observing a specimen up close, they behave more like a microscope. This is super convenient when you don’t have a magnifying lens or microscope handy and want to look at the finer details of a specimen. Here, Elijah is examining a bunch of seeds from one of the many sycamore trees around the CMoG campus. 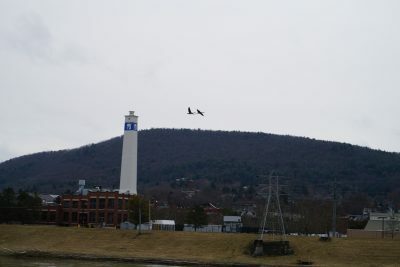 We used a camera with a powerful zoom lens to capture this image of two Canada geese flying over the Chemung River. 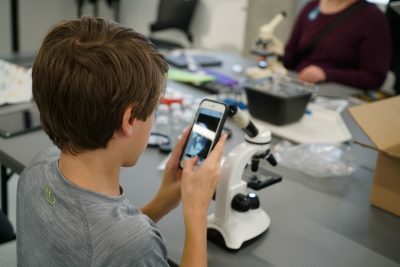 It was very important that we documented all of our findings to upload to iNaturalist, “an online social network of people sharing biodiversity information to help each other learn about nature.” This free app helped us identify many of the species we photographed, which we double-checked against field guides. Over the course of 14 days, we identified and documented more than 100 species of plants, animals, protozoans and fungi living and growing around the Museum. Who knew there were so many different things around our small urban campus? So, the next time you go for a walk, look a little closer and discover the biodiversity of your neighborhood! There really is more than meets the eye. We would like to thank all of our program partners, volunteers, and docents who helped make CMoG Nature Adventure possible. Thanks also to the New York State Department of Environmental Conservation and its Division of Lands and Forests for providing wildlife brochures and literature.